Ani Phyo is my kind of gal. She's an on-the-go, no nonsense, get it done kind of woman and, much like myself, she doesn't have time to labor in the kitchen but still wants something good to eat. Ok, sounds like everyone I know. 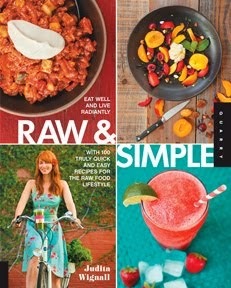 I really enjoyed her first book, "Ani's Raw Food Kitchen," and refer to it constantly for ideas. After going through these recipes, I know I'll be using this book for a long time as well. There are 85 wonderful sweets and treats in here that you can whip up in a jiffy. Everything from pies to cookies to chocolates and parfaits, there's something in here for everyone. This isn't Matthew Kenney style dessert (love his books too, btw), no labor intensive recipes that take three days to make. This is dessert at its most basic but still very original, elegant and delicious. I've already made her Liquid Chocolate and her Strawberry Kream Cheezecake. The Liquid Chocolate is so amazing. It reminds me of Dairy Queen dipped cones when I was a kid but better. Going to try out the Lavender Chocolate Bars and Banana Bread Biscuits next and then maybe the Pear Ginger Crisp for Mother's Day. This is definitely a fun recipe book to add to your collection. I'm just hoping I can still fit into my pants after this week.